Samuel W Ross, MD, MPH, Bindhu Oommen, MD, MPH, Mimi Kim, MD, Joel F Bradley, MD, Kristopher B Williams, MD, Amanda L Walters, MS, Kristian T Dacey, MHA, Vedra A Augenstein, MD, Brant T Heniford, MD. Carolinas Medical Center, Dept. of Surgery, Division of Gastrointestinal and Minimally Invasive Surgery. INTRODUCTION: Controversy still exists on the optimal approach to repairing paraesophageal hernias. Open and laparoscopic abdominal and thoracic approaches have been fervently described. We hypothesized that patients undergoing the minimally invasive approach would have superior outcomes when compared to the open approaches. METHODS: The American College of Surgeons NSQIP database was queried for all elective, adult, laparoscopic, open abdominal, and open thoracic PEHR from 2005-2011. Patient demographics, operative characteristics, complications and outcomes were compared by open vs laparoscopic approach using standard statistical methods. Multivariate analysis was then performed controlling for age, BMI, functional status, smoking, Charlson Comorbidity Index (CCI), and obstruction, which were set a priori. RESULTS: There were 6,771 laparoscopic, 357 open abdominal, and 30 open thoracic PEHR. The open approaches were grouped together for a total of 387 open PEHR. There were 65 concomitant Collis procedures and 1416 patients had mesh placed. The laparoscopic group was similar to the open group: age (57.1±14.8vs57.9±14.8 years), male (28.5%31.8%), BMI (34.1±9.4vs34.3±9.4 kg/m2), smoking (10.5%vs8.4%), CCI (0.3±0.7vs0.3±0.8) mesh used (19.7%vs21.5%); all p>0.05. In the open group, Collis gastroplasty was more frequent (0.8%vs2.6%, p<0.001) and there was a higher frequency of obstructions (4.4%vs10.0%, p<0.001). The most common concomitant procedures at the time of PEHR were: Roux-en-Y gastric bypass (9.6%vs11.8%, NS), gastric banding (16.8%vs6.8%, p<0.001), upper endoscopy (9.3%vs5.4%, p=0.006), and PEG (1.0%vs 0%, p=0.021). Patient outcomes by operative approach are compared in the Table. On multivariate analysis, open repair was independently associated with significantly worse patient outcomes: wound complications (OR 3.7, 2.1-6.5), minor complications (OR 3.2, 2.2-4.7), major complications (OR 2.1, 1.3-3.4), longer length of stay (LOS) (2.5, 1.1-3.9) and mortality (OR 4.1, 1.5-11.3); all p<0.01. Operative time and need for reoperation were equal. 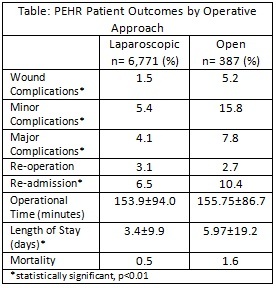 CONCLUSIONS: After controlling for confounding variables, patients undergoing open PEHR have a significantly higher rate of minor and major complications, have a longer length of hospital stay, and a higher mortality rate when compared to the laparoscopic approach. Although factors such as recurrent hernia and hernia size cannot be assessed in the analysis, national data strongly suggests that the laparoscopic approach should be pursued when possible for PEHR to reduce morbidity, mortality, and LOS.